A week or so before I went to Dublin with Lukasz to visit Jameson, I had the pleasure of attending an event with Diageo, at the Scotch Whisky Experience, to promote the art of blending. We were invited to sample The Directors Blend bottlings from its conception in 2008 right up to the 2012 edition. Whilst the trip to Jameson showed us how blends can be cool and laced with action and style, this tasting had another message to convey. The craft behind blending itself. The Directors blend as a concept was conceived by David Gates, the Global Category Director at Diageo. The premise was to create an annual release to help stimulate the discussion of blends within Diageo. It’s produced in very small quantities, about 500 bottles, and then gifted to Diageo directors around the globe. The idea is that the bottle will then be shared, discussed and enjoyed whilst reminding people about the interesting and unique process behind blending. A little self-indulgent? Sure. But I find that the general educational message behind the blending process is something quite interesting and, if approached and directed in the right manner, is something that could appeal to the current drinking market. Craft, boutique and premium are the drinking buzzwords for ‘cool’ at the moment but due to the very nature of blended whisky production, blended Scotch whisky struggles to fit into those categories. However, spending an afternoon with Caroline Martin, Master Blender at Diageo, helps to highlight the craft that goes on behind the scenes. According to Caroline, Johnnie Walker has always had a specific approach to blending – based on skills learned in tea blending. Records show that by the time Alexander Walker II got on to the scene, they had developed a systematic ‘building block’ approach to making blends based on regional and flavour characteristics. The building blocks were created by playing around with the myriad of changeable factors, subtly changing maturation, the use of each distillery and the type of wood. This approach has defined 6 Cardinal influences and the process has been handed down through successive master blenders. Grain – Spicy Cereal – from a 19th Century background “filler” (first used in 1860s), early 20th century blenders, including Sir Alexander Walker, used grain whisky to greater effect. Binds the malt whiskies together. Provides a catalytic effect – tends to open up flavours of malt whiskies. Highland Malt – Robust Savoury – meaty with smoky elements. Backbone and body to early Walker blends. As distilling techniques improve in the early 20th Century so this style fades as more sophisticated and appealing Cardinals appear to take its place. Highland Smoke – Complex Smoke – a lingering remnant of the earlier Highland Malt cardinal style. More controlled as it moved into the 20th century and Islay production improved. This Cardinal forms the heart of Johnnie Walker Black Label and Johnnie Walker Gold Label, which demonstrates the different forms the Cardinal can take dependent on the influences that are considered necessary for the blend. Speyside Fruit – Fresh Fruitiness – early 20th Century phenomenon. With the use of Bourbon wood, this Cardinal contributes to the lighter flavours of Johnnie Walker Red Label. Island Malt – Powerful Smoke – memories of the earliest casks in the Kilmarnock shop. 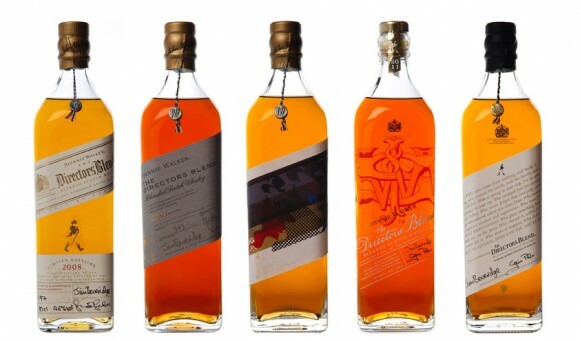 Backbone of Johnnie Walker blends (increased in sophistication from 19th to 20th century). When there is need for a visceral smoke effect. The Cardinal shows in Johnnie Walker Blue Label and in the smoke traces of Johnnie Walker Red Label. Each of The Directors Blends were designed specifically to show the craft behind one of these cardinals and their variables. I will list my tasting notes in the next post and tell you a little more about each bottle. The process is a fairly simplistic way to show people how much work and craft goes behind even the cheapest Johnnie Walker Red. The countless years of fighting a bad reputation against single malts may mean that Scottish blends are not as cool in Scotland as their Irish counterparts are over there. If I took a bottle of Bells over to a non-whisky friend he may be wondering how the hell he is going to tackle drinking that stuff. However, if young Scottish drinkers are willing to see the craft behind these blends, then they may just give it a shot. With a mixer of course! This entry was posted	on Thursday, April 4th, 2013 at 5:20 pm	and is filed under Musings. You can follow any responses to this entry through the RSS 2.0 feed. Responses are currently closed, but you can trackback from your own site.